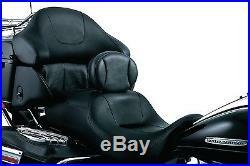 Great comfort at a great price makes the Plug-In Driver Backrest a must have for any rider on long or short hauls. The contoured upholstered backrest comes with a removable back pocket, tool-less height adjustment & removal, & easy installation using the existing fender bolts. Fits: One-Piece Slotted Seats on'97-'16 Electra Glides, Road Glides, Road Kings & Street Glides. One-Piece Slotted Seats on'97-'16 Electra Glides, Road Glides, Road Kings & Street Glides. If an item is out of stock or oversold the customer will be notified of the date that the item will be back in stock. An estimated restock date will be provided at the time of cancellation. 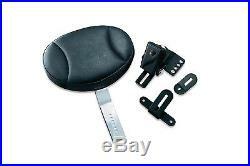 The item "Kuryakyn Plug-In Driver Backrest Kit for Harley Touring FLH/T 97-16 1 Piece Seat" is in sale since Tuesday, May 20, 2014. 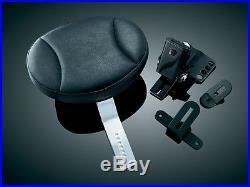 This item is in the category "eBay Motors\Parts & Accessories\Motorcycle Parts\Seats & Seat Parts\Seats".